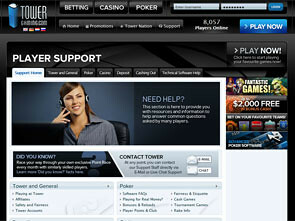 Tower Gaming sportsbook has been online since 2007. Licensed in Malta, this online sportsbook offers you nice bonus to start with, decent quality of customer support as well as various betting lines to appreciate. You can choose among such sports as football, snooker, baseball, volleyball, fighting, rugby, golf, motor racing and many more others. There is no limitation concerning minimum stakes, while the maximum stake depends on the events you are betting on. Tower Gaming sportsbook provides you with the useful information how to place bet that helps you to enjoy betting online with profits. 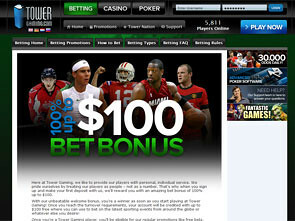 All the new customers of Tower Gaming can get 100% up to $100 to start betting with free cash. Just register a new account and deposit at least $20 to get your bonus. This promotion is available for all new customers except players from the UK. You should turnover your first deposit 10 times on at least 10 bets before you will be credited with your 100% Match bonus. You also should place your bets with odds 2.0 or greater to meet the turnover requirement. To start betting online you should register an account. Just fill in special form indicating your name, address, age, email, etc. You will receive an email with unique activating code to enter your account for the first time. Then you will use your username and password to log in. 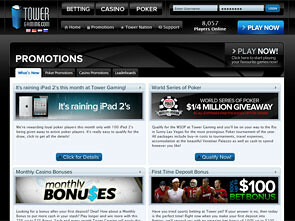 Tower Gaming provides you with amazing demo How to Place Bet. 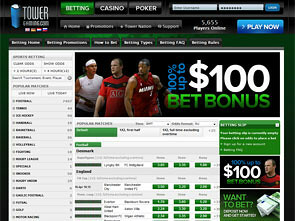 It shows you in simple way how to start betting online and enjoy this pastime wagering your favourite teams. You can choose among such payment methods available as Neteller, MoneyBookers/Skrill, Click2Pay, ClickandBuy, Visa, MasterCard, Webmoney. Place your first bet to receive nice 100% Sign Up bonus and start betting with free cash. Log in and click Deposit button to start betting for real money. The customer support is available via Live Chat or email. You also can visit quite useful FAQ page where you will find out the answers on all important questions such as how to place bet, what countries can play Tower Gaming, how to cash out and how long to wait for the winnings, whether there are any security fees, etc.